Anktangle: Part-Time EC: Why Bother?! My partner and I practice part-time elimination communication (EC) with our son. Sometimes when I say that, I feel kind of like a fraud because we're not at all diligent about it like lots of other families I know. But the truth is, many families practice part-time EC, and most families who do EC all the time are still using cloth diapers as back-up and/or when they're out of the house. EC emphasizes communication between the caregiver and the child. It uses timing (after naps and mealtimes are good times to try the potty), cues (from the baby) and signals (from the caregiver), and caregiver intuition facilitate the process. Each baby is different in how she communicates her elimination needs, so this practice involves patience and flexibility on the part of the caregiver. EC is sometimes called "natural infant hygiene" or "infant potty training," though it is not potty training in the traditional sense. There are not rewards (for "catches") or punishments (for "misses") it is simply a way to attend to your child's elimination needs that involves paying attention and subsequently responding to your baby's cues and natural daily rhythms. I read some about EC before I was even pregnant, and it intrigued me that in developing countries, babies are carried around diaper-less, and yet, their mothers aren't covered in baby excrement. (Some brief examples of EC can be seen in the movie Babies, where both the baby from Namibia and the baby from Mongolia are shown being toileted by different methods by their caregivers.) During my reading, I was fascinated by the assertion that in the United States (and other industrialized, diaper-using countries) we essentially teach our babies to pee and poop in diapers, and then have to un-teach them to do that when they're older. Diapering is (understandably) considered a barbaric and backwards practice by people of cultures who are accustomed to seeing and practicing EC all the time. Baby humans—like baby animals of other species—have an instinct to not want to soil themselves or their nest. If you've ever seen a baby bird back up over the edge of the nest to poop, you've witnessed this instinct. Similarly, dogs won't poop in the place where they sleep, instead they'll designate a specific area for each, and they won't mix the two. Babies also don't like to be sitting in their own waste in a wet or dirty diaper (they like to be clean)! This is why (and I'm sure anyone who has cared for a baby has experienced this) a little one will often wait for a clean diaper to pee or poop again. You're thinking, I just changed your diaper, and you have to go again?! But the baby has actually held it until the clean diaper was available to them! I've experienced this instinct in my son many times. Most recently, I witnessed him squat to empty his bladder before climbing into a kiddy pool in my in-laws' back yard. He often will go to the bathroom right before or right after a bath, too. I think it's so cool to know that kids this young are so naturally aware of their bodily functions and totally able to hold it until they're in an appropriate place. So even after all that information, why the heck would I bother taking my baby to the potty (even some of the time) when he'll just go in his diaper anyway? It's free! It doesn't cost a penny more than using the toilet regularly (and it can cost even less if you frequently potty your baby outside). It actually saves both time and money: every catch means one less diaper to change now and then wash later. The fewer diapers we use in a week, the less frequently I have to wash, and less washing cuts down on the overall (time and money) cost of diapering. It's the ultimate in environmentally friendly choices: no matter how you choose to diaper the rest of the time (cloth, disposables, hybrids, etc.) fewer soiled diapers means less impact on the environment. Less time spent in a soiled diaper and more time spent with skin open to air means less diaper rash (and other diaper-related issues). It's an intimate bond with your child. Any time you're helping someone with their toileting needs, you're attending to a very private part of their life. The communication aspect of EC is really rewarding and connective. It's what I would want someone to do for me if I was unable to verbally communicate my elimination needs. That's what it comes down to for me: it feels like the most respectful way to help my kiddo with his toileting needs until he's able to do it without help. Those are just a few reasons I practice EC with Daniel. For us, it's mostly gotten easier over time, as he learns to communicate his needs more clearly. I potty him mainly based on timing (after naps, after meals) though I do watch him closely for signals when he is about to poop, and I cue him to go using a sound. I also use ASL signs for "toilet," "poop," and "pee," even when I'm just changing his diaper. Ever since Daniel started making the cue sounds back to me, I find it particularly entertaining. He seems to enjoy the whole EC experience, even when he doesn't have to go. How about you? What do you think about elimination communication? Have you ever tried it? Do you think I'm a little too far out there now? I'd love to hear your thoughts! 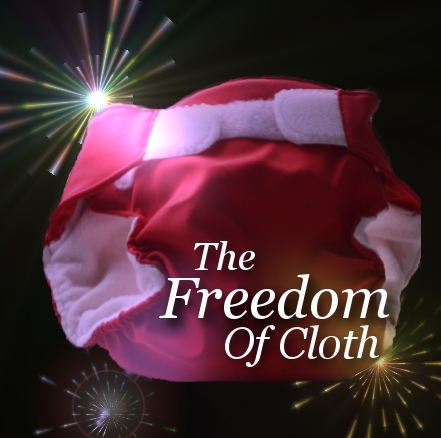 Monday, July 4th, 2011: Choosing Your Cloth Style — Today’s posts discuss parents' individual journeys to finding the cloth diapering "style" that best suits their families. 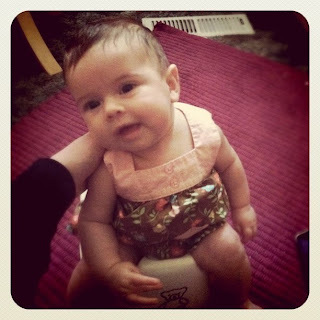 Saturday, July 9th, 2011: Inspired by Cloth — For today’s theme, we’ve asked writers to explore the ways cloth diapering has inspired them to become "greener" overall. I love your succinct and common sense explanation of what EC is and totally concur with your reasoning on the value of practicing it, even if only part time. I love your last point it - that it's what you would want someone to do for you. I seldom think of it this way, but that's so true. EC is a wonderful way to honor our children and their needs. Thank you so much for sharing this, Amy! Amy thank you so much for this! I have been contemplating starting part-time EC, but still hesitant (when I first heard of the idea I thought it was crazy...but the more I read and learn of course the more it makes sense). This is fascinating. I am definitely interested in EC with my next child, I did not know about EC when my son was born and now it looks more like potty learning. Though with this break from work I am trying my best to understand his cues or to at the very least time trips to the potty better. Though unfortunately since he is older the potty can be a bit scary and uncomfortable. It does disappoint me that I did not do more in the beginning to understand this and that I missed out on this opportunity to communicate with my child and to practice better hygiene methods with him. I do have it in my mind that for future children I am not going to miss an opportunity like this. Thank you for such an informative post. Great points. I especially love #7. The reasoning I get the most for not doing EC is that it might stress out the baby - Our culture is obsessed with "readiness signs." I try to point out to those people that it is better for the baby as well. They don't want to sit in filth and it is true that babies, from birth, pee when the diaper is removed to avoid having to sit in their own waste. My son will poop just a little in his diaper, then WAIT until I place him on his potty to finish. great post! adding to SUnday Surf! Thank you for writing about this, Amy. I think so many people hear about E.C. and think that it's too hard because they have to do it full-time. Part-time ecing makes sense for most families in the US. It takes the pressure off the mindset of training and onto communicating. It goes straight to the heart of controlling our children's behaviors to suit us instead of allowing them to lead us. It is hard to stay comfortable being out of control, but once the struggling stops, it becomes easier, I think. I am glad to see Mamapoekie will be sharing this. Perhaps more parents will consider giving ec a whirl after reading your post. We have only EC'd part-time with each child (and very casually, at that...off and on). With my daughters, my first was pooping in the potty consistently by 11 months, and both girls were completely potty-learned (even going by themselves) at 18 months! I haven't done much work at all with my son though (now 16 months) but we've done enough that he clearly understands where to go to go potty, and he knows when he needs to. Part-time EC has worked awesome for us. I am not able to do full-time EC but am VERY happy with how what we CAN do has worked for us.